When I started learning about blogging, one piece of advice I found was: “Tell people what your blog is about”. I’ve tried several times to do this by encapsulating, in word picture or parable form, what seems at the time of writing to be the very heart of the matter. It’s like trying to catch a greased pig. Every attempt to define this blog by writing about it changes it. And I’m getting fed up with baring my soul in sidebar and then having to delete what I’ve written because it Just Doesn’t Fit. I want to be done with that and get on with the act of simply writing the blog! I thought maybe I’d just skip this part, and then I realized that every time I read a blog post I enjoy I skip to the “About Me” to decide whether I want to hit the Follow button. This image is to take your mind off the pig image. 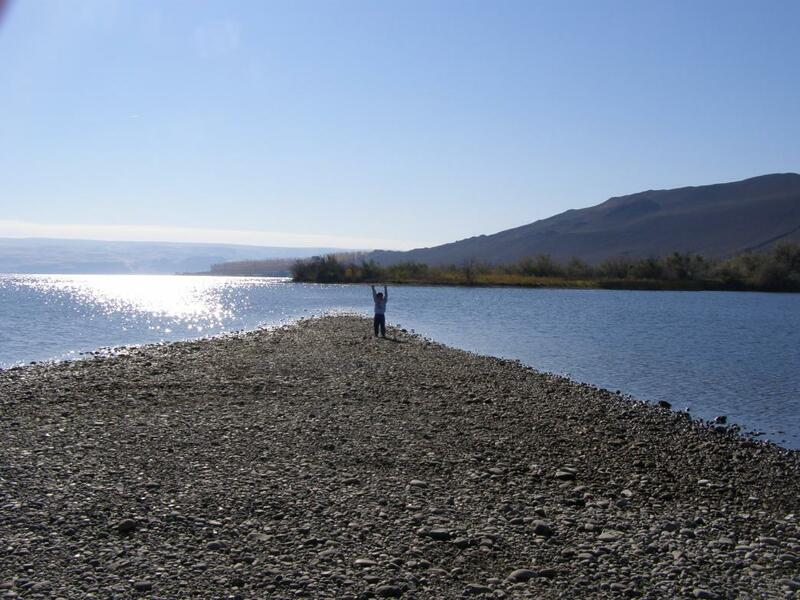 My grandson at the Columbia River, near our home. I started this blog because in more than half a century I still haven’t figured out how to answer the question “Where do you want to be five years from now?” and in consequence I find myself not entirely sure of where I am, or what I think about being here, or which way to point myself next. Some moments I know I am rich beyond measure, others I am overwhelmed with grief for broken dreams and missed opportunities. This blog is a place I have made for myself to unpack my baggage and decide what I want to keep, and what should go. I write because that’s what I do, and when I stopped doing it for a while I did myself harm. But while I greatly admire those bloggers who can remain consistently entertaining / challenging / thought-provoking / on topic, this blog is intended to be a catch-all for pretty much whatever I feel like writing about. If you’ve stopped by, I want you to know that you’re welcome. I don’t have any answers for you, but I’d love to share the questions. So pour a cup of rooibos tea and grab a koeksister (or throw a burger on the BBQ if that’s what you prefer – they’re made with Happy Beef raised right here on our farmlet). Kom kuier ‘n bietjie. Even if we don’t manage to figure out The Meaning And Purpose Of It All, It’s always good just to take time out to ponder. Pictures to evoke Africa usually involve elephants and acacias or baobabs, and are guaranteed to make me ache with homesickness. 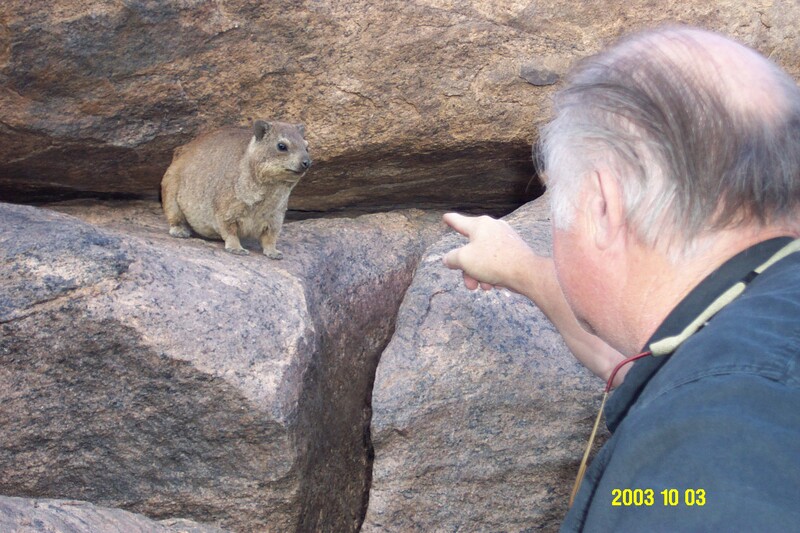 But this picture of Himself coming face-to-face with his first dassie, the little cousin of the elephant, at Augrabies Falls, tells a more personal story. Transplantation hurts. Roots break, leaves shrivel, trunk bows and limbs bend at the onslaught of unfamiliar winds. The older the tree, the greater and more lasting the damage. I was 40 when I pulled myself out of the rich earth that, over eons, has filtered to the bottom of Africa, and set myself into the stony ground at the top left corner of the USA. I have been here now nearly half my adult life. And I have learned to love the furnace of summer, the icy blast of winter, and the lingering blush and glow of spring and autumn. I have learned the subtle beauty of sagebrush, the fragrance of wild roses and the the brief profusion of daffodils and tulips, and the extravagance of a river that, it seems to me, could slake all Africa. It is hard to breathe the thin, dry air of this place. The shade I cast seems distorted by the low-rising sun. My fruit shrivels without ripening. The seeds I let fall are few, and do not set root. My heart cracks with longing for hadedas and braai smoke and koeksusters and township jazz played too loudly in the street on Sunday afternoon. I imagine carving myself into a boat that will float down the river and across the ocean, all the way around the world. I cut sticks and carve them into pencils. I will draw a map. I will write my way home. Thank you! And welcome…:) I’m still quite new to the Blogoverse, and am quite delighted to find that it’s full of the most wonderful people. Ek glo jy bedoel OOSTE Washington, nie WESTE Washington te skryf. Ons hier in die Ooste Washington woon in die platteland; die skelems in die Weste Washington woon in die bos. Ag foeitogie, KokkieH ! Jy maak my honger vir ‘n goeie Suid-Afrikaanse kos ! Hey, REDdog, thanks for stopping by! And I’m glad to know you appreciate the finer things in life. Nothing quite as yummy as happy bacon – or as disgusting as what goes into making sad bacon, for that matter. Ditto to the ‘what’s it about’ dilemma! I don’t have a theme anymore either, it’s a lucky dip 🙂 and I can barely think about what I’ll be doing in the next five minutes not years, life is lived in the now for me! I think it’s important not to lose sight of what one wants to accomplish with a blog. I periodically get hung up on the perceived need to attract more followers by generating desirable material, and while I absolutely love knowing people are reading my stuff, I keep reminding myself that this blog is not actually about being well known or popular. It’s about figuring some things out, while getting back into the writing habit. As long as I focus on that, and not on pleasing or attracting readers (much as I love and appreciate them all! ), it’s serving its purpose. I liked your book reviews. Would you consider reviewing my book if I send you a copy? I would love to do so! Email me at beladonatok@gmail.com if you’d like an address for a hard copy – or to tell me how to download an eBook. I have a Kindle but little experience in using it. Well, thank you ma’am! Welcome aboard. I took a look at your blog too … I see we agree on the subject of “Frozen”. I babysat a small girl recently to give her parents some “husband and wife” time, which was my great opportunity to watch it. Argh – those creepy eyes! I saw “americansoustannie” on OM’s blog and had to stop by. So bly ek het! Jy is baie welkom! Thank you for stopping by. Your blog looks yummy … and your little Pearl reminds me SO MUCH of beloved kitties in my past! I’ve always been a sucker for skinny all-black cats. Apparently you’ll often find a black one in a litter of purebred siamese, and if the breeder lets it live it will likely grow up looking just like that. Thank you for the kind words about my blog. Pearli is a rescue: the only black with two ginger boys – both as skinny as she. I do think, though, that she has a bit of Siamese in her/them. Her long nose and big voice when she doesn’t get her own way, might just do it for me! Lekker dag! Het ons nog ‘n Seffriken lees die Soustannie blog ? Hello Belladonna! I’ve decided to read and follow 15 interesting and new blogs a day every day for the first month of 2015, and yours is today’s #14! Feel free to come visit me when you can at http://www.thatssojacob.wordpress.com, and follow if you like what you read. Happy new year and happy blogging! An exquisitely beautiful “Starting Point.” I am gobsmacked at the lyrical quality of your writing. As to the torture of an “About” page, it really is rather impossible, isn’t it? You fall into good company, Belladonna, there are a number of us out here who are “nicheless.” And rather relish it! I am happy to encourage somebody with your talent. Just keep doing what you’re doing. Write for yourself and don’t worry about followers and all those “awards.” Your peeps will find you! I’m looking forward to getting to know you better. No worries if you can’t accept the award. Looking forward to reading more of your blog! Argh! Homework! Lol. Okay … seriously, I made a decision to accept awards ONLY if I could have fun with them. This looks like potentially a fun one, but I need to think on it a little. In the meantime, thank you for the kind words, and for continuing to follow my blog! You’re completely welcome!! Great blog. I pressed follow as soon as you drew a comparison between blogging and a greased pig- not sure if I just really appreciated the imagery or the humour tickled me. Either way, I look forward to reading your posts! Thank you, and welcome! I’ll take a look at your blog in a bit too… 🙂 In the interest of complete candor I’ve never actually wrestled a pig, greased or otherwise … but then, when I wrote that, I’d never really blogged before either, and I was finding it hard to get a grip on just what I was trying to achieve. I think I might have hold of an ear and a tail now, but am still never entirely sure which direction I’ll go next. Well, thank you so much, and welcome! You did actually respond, but I certainly appreciate the follow up visit. Hope things are going more smoothly for you, and that those idiots at the pinnacles of WP power have recognized what an asset you are to the community. (2) this could be seen as denigration of my About page’s writing style, which would then seem an insulting followup to your praise of my writing–although I would have intended it only to refer to the purposely broad comedy approach I attempted, versus your more serious style here. And THIS is why it takes me frigging forever to read other people’s blogs. Over-analyze and over-share much? How much is insecurity, how much ego, and how much Aspies? Time for another self-involved tangent–and she’s off! The beauty of your last three paragraphs took MY breath away. My eyes are still tearing as I finish typing this. My eyes are tearing too. You make me laugh SO MUCH! I’m so glad to meet you! And I particularly love the fact that you find my greased pig image elegant! Also, just so you know, I am pretty hard to offend. Although I would love to be able to show you elephants, and how they move like smoke and disappear behind stick-thin, leafless trees. They are magical creatures! I fully believe that elephants are capable of that. I’ve gained 22 pounds in two years and am, per charts and tape measure and shrinking undies ( ;), a growing girl–hips now around 40″. Yet, everyone still thinks I’m thin. STRANGERS call me thin, when even the undies marked L are too small (although honestly, who do they make those for, anyhow?) I must assume some of my body fat resides in a magical fourth dimension (not time at all–who knew?) where others cannot see it, but it still causes me to bump into walls and be unable to get up off the floor without pushing off with my hands. Perhaps I shall be lucky, and brush up against an elephant behind a tree! Now I could get used to a problem like that. As for the purpose of absurdly small undies … I’m pretty sure they’re for drunken male college students to wear on their heads while making elephant noises. Ha ha ha!! True LOL at that! Still laughing. Great image. I’ve been jumping all over your blog – love your writing, and your free spirit. Thanks for following our blog. I hope you enjoy the stories of our journey. And don’t be a stranger, come on over and join the conversation. Thank you – I most definitely will, and thanks for stopping by! Hello, Belladonna. Thanks for visiting my site and choosing to follow along. Your “About” page mesmerized me—I’m adrift on your boat writing ourselves home. Well, actually, when I first arrived, as Himself was driving me home through miles and miles of sagebrush, I informed him that “I’ve just traveled 11,000 miles and I’ve landed in the Platteland!” (which translates as “flatland”, but means … oh, a whole lot more, that is evoked somewhat by dry scrub and wide open spaces.) It’s not just “nature” … Africa has an essence that simply cannot be replicated anywhere else. I suppose that’s true of most places, mind you. Thanks Bella, As far as “sickness” and health, the sickness peaked in May and then in July. Contagious or what??? !! Thanks for your kind note. I truly enjoyed your posts, chuckling loudly. Umm … can’t find the latrine post. Would you like to share the link here? I’d love to read it! Belladonna.am wiping my face here having read your shared post … my eye roll earlier was to ME not to you. Sometimes my words on paper are two dimensional;inflections aren’t heard and the tenderness gone. I hope it didn’t come across that way. Happy to have found you. It’s fine – it is almost impossible to offend me, and in this case I assumed you were rolling your eyes at yourself because … well … that’s what I would do! Hey, Marina! Great to have you on board. I’ll be posting again soon … It’s been a painful few months and processing has taken time. Met drukkies van McGregor af….. Thank you. Perhaps that it still seems young & fresh – to at least one reader answers the question? Ag! Makes me want to be back in Seffrika… First time I ever tasted KoekSISTERs was courtesy of a kind elderly Afrikaner couple who ran a small gift shop & deli near the site of the battle of Blood River. They are far superior to donuts ! !